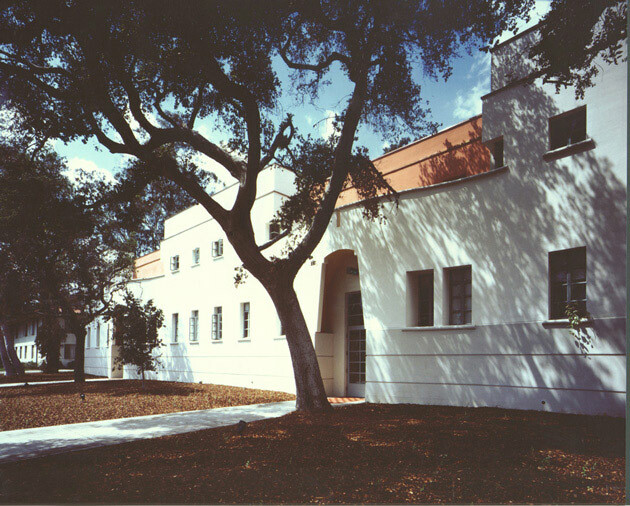 Lyon Court is an addition to Harwood Court, a historic dormitory built in the 1920s just south of Pomona College’s main quadrangle. The new long, thin building is an addition that completes the principal courtyard of Harwood Court. A series of beautiful mature oak trees occupies the southern part of the site between the new building and the playing fields beyond. The southern elevation reflects the scale of the playing fields and the rhythm of the room clusters within with a simple, repetitive program of student rooms. The northern elevation is centered on the dormitory’s common room and is composed to respond to the massing of the existing building and the landscape character of the courtyard. The reading room at the east is designed as a tower that marks the intersection between two major axes on the campus. With walls laid in three slightly different shades of colored concrete block and sandblasted to give a stone-like appearance, the dormitory is designed to accommodate generations of student residents.